What do the labels on Egg Cartons mean? Does my back yard flock meet these labels? 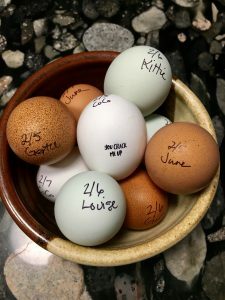 Are my chicken’s eggs healthier vs. store bought eggs? We eat our chicken’s eggs. I sell the eggs. 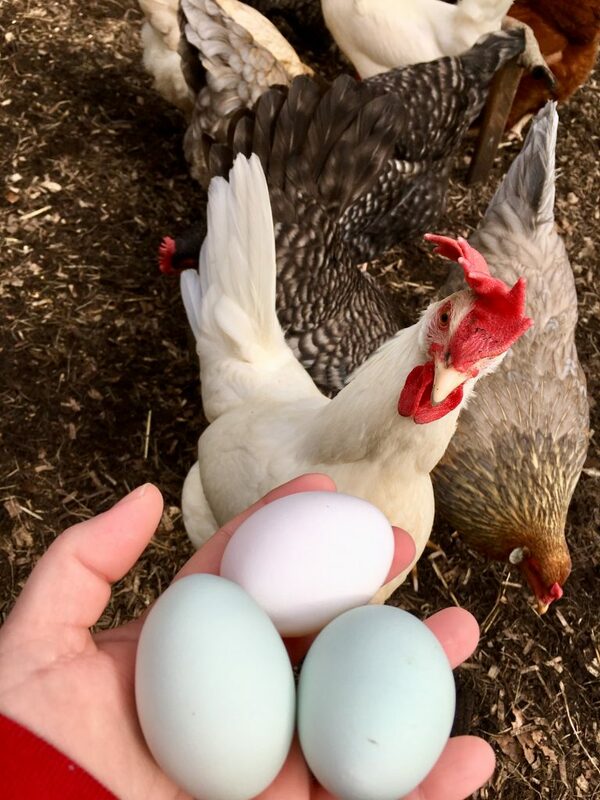 Our chicken eggs are given to our family. It’s important to me to have the best eggs possible. Marketing always manages to sneak into our subconscious whether it is right or wrong, especially when we really haven’t done the research to ensure the claims are accurate and meaningful. Then there’s the whole question of what is accurate. ALL NATURAL There is no legal definition for all natural. Does that mean our chickens eat natural bugs vs fake bugs? FARM FRESH– Again, no legal definition for this. Did the eggs come from a farm, like with crops and cows? Were the eggs from a farm that has 2 million chickens laying eggs in cages? What about my 1 acre, is this a farm since we grow food, raise chickens and have a pack of chihuahuas? HORMONE-FREE– Are you aware it’s illegal to give hormones to poultry in the USA? Therefore all eggs and chicken are hormone free so the label is redundant. ANTIBIOTIC-FREE– Laying hens are not typically given antibiotics although some meat chickens may have been if necessasary. USDA-CERTIFIED ORGANIC– A farm must apply for this designation and undergo inspections to ensure all standards are being met. Chickens are fed organic feed from their 2nd day of life. 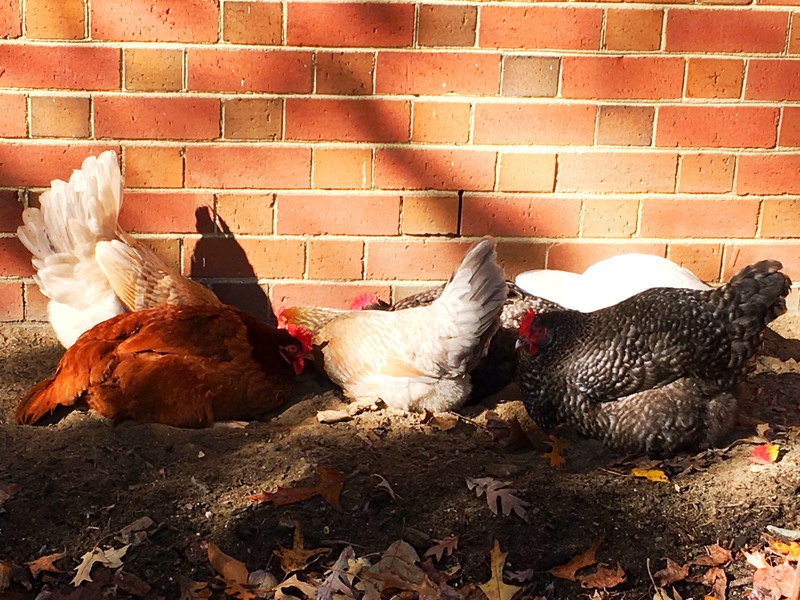 In addition, the chickens must have access to the outdoors. I am not certified organic, however, I take great care to meet the needs of my chickens, and they are only fed organic non -GMO food. In addition to a great deal of research on my part, my daughter, Stevie, who works for the USDA specializing in poultry and has been an excellent resource. Perfect hard-boiled eggs was a feat in which I strived for my entire adult life. I have attempted to have perfect hard boiled eggs thousands of times. I’ve never had any success until now! I swear to you. I have tried every method out there. With each attempt, I would have eggs that wouldn’t peel. Every egg I ever cooked looked like it had been malled by a wild animal after it was peeled. Ask my husband, ask my children. Seriously, go ask my BFF Raquel whom I would I repeatedly beg her to boil eggs for me! I tried for perfect hard-boiled eggs by placing them in cold water, enough to cover by an inch, which then was brought up to boil. I turned the heat off and let sit covered for 20 minutes. Peeled eggs resulted in half the egg white pulling away with the shell. I boiled eggs with a tablespoon of vinegar. Or a scoop of baking soda. Also, Boiling the eggs for 5 minutes. Another time 7 minutes. Plunging the boiled eggs into ice water to cool. Another time leaving them to cool in the pot on the stove. Peeling them under running water. All with the same un-peelable results. This is Frida, but I’m thinking she is a he, so really this is Fred. 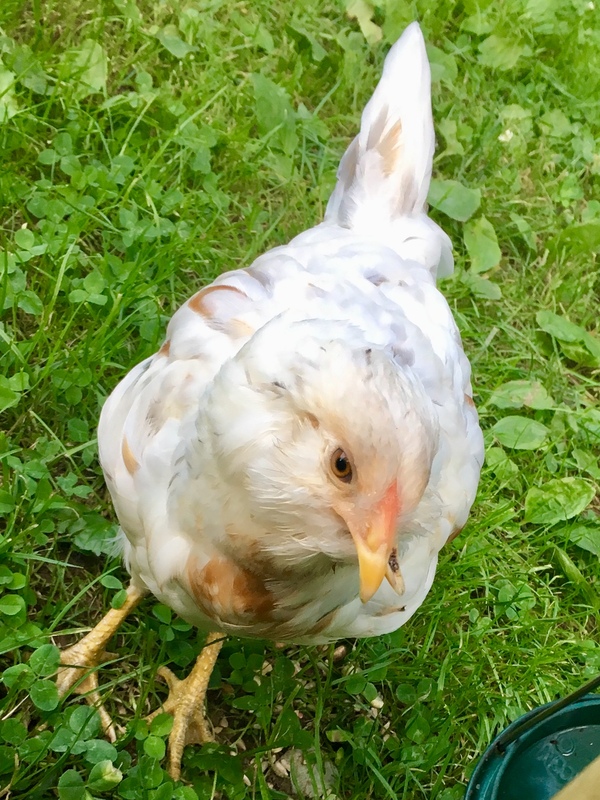 When we decided to have chickens we knew we wanted all pullets, which are chickens that have been sexed to ensure they are female. You pay a bit more for the guarantee. 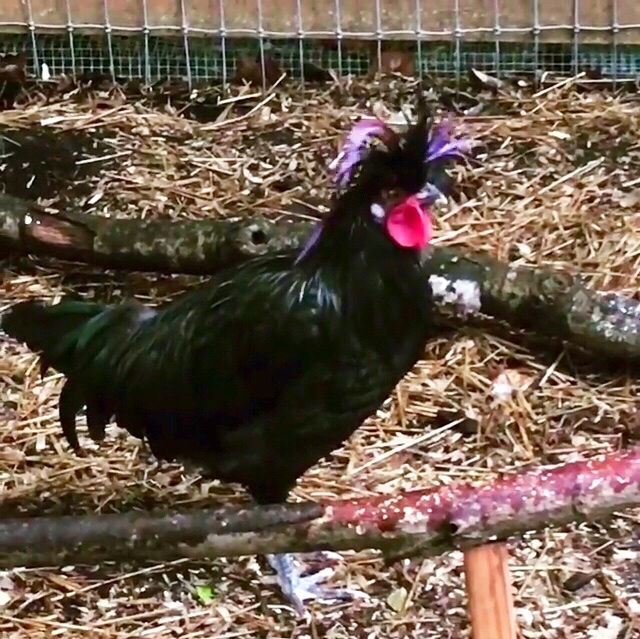 When I went to pick up our White Leghorns they had also just received in a bunch of Polish Crested, they were so cute, I tried to resist. Not very hard, obviously. I chose two, a black and white one and a brown one. Because these were a straight run, not sexed, I knew I could end up with a rooster, or two. The brown one is Ester, she is half the size of Frida/Fred. They both are friendly and easily let me “catch” them and hold them a few minutes. Our neighborhood, Queens Lake, is in Williamsburg but we are considered rural residential. There are different rules for different districts within the city. Because we are rural we can have chickens, one chicken for every 2500 square feet of property with a maximum of sixteen chickens. We hope to have them free range the back yard but so far they are sequestered to the chicken run. I have worked hard to make the run a fun chicken space. I understand chickens can get bored and I don’t want that. That’s when they find trouble. We did have two chickens escape this week. I had Covered about 50% of the area above the coop but had run out out netting. Apparently I wasn’t moving fast enough to get some more. It is now 100% covered. 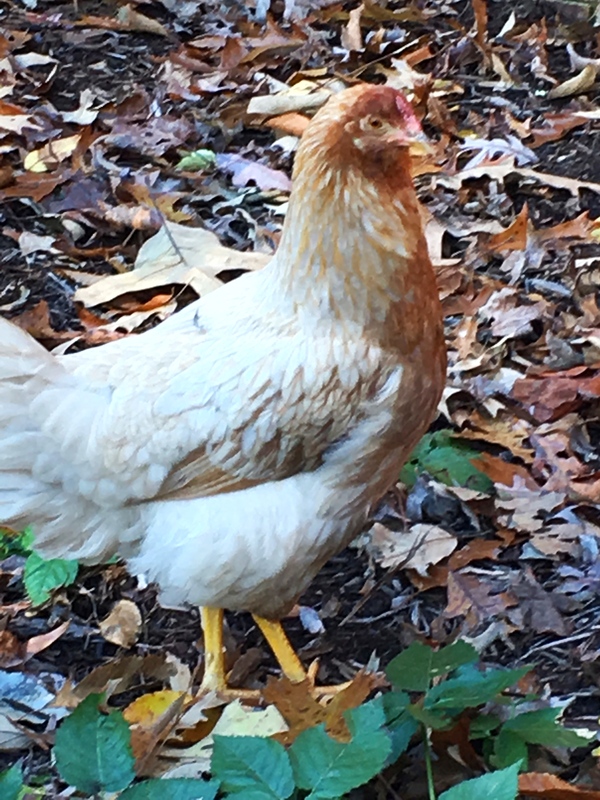 I understand the number 1 killer of backyard chickens are dogs. I certainly will do what I can to prevent untimely deaths. Cali, our Chihuahua/Beagle mix, has a very unhealthy interest in the chickens. I also have a special needs chicken. This is Bea, she is an Ameraucana. She has developed a scissored beak. 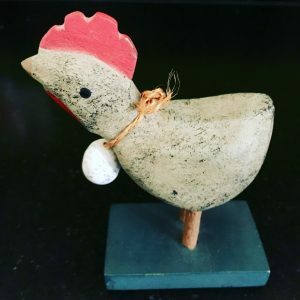 If you want more information I am directing you to my favorite chicken blog, The Chicken Chick. She tells you about this better than I can. But basically so far Bea is doing well. She eats and drinks with the only noticeable problem is she sometimes can’t pick up treats from the ground or my hand. Small things like clovers sprouts can be too small for her to grip. I’m keeping a close eye on her and I always try to hold her for a few minutes to really acclimate her to handling, but she doesn’t love it. I want it to be easy to check her out and if need be give her some help with out her also being afraid to be handled. This is my Production Black, I think. I have one of these and two Cuckoo Marans, They all look alike. I can’t tell who is who. But they are rather friendly and easy for me to pick up and hold. They are curious little ones and always are right there to see what I might have in my hand. Lately they have been loving sprouts, clover, wheatgrass, alfalfa and such. I started some sunflower and radish sprouts. I’m sure they will be ready to try those, too. I’m learning a lot about chickens. And there seems to be lots of adjusting as they teach me more and more everyday about what they need. So it’s petty interesting around here. Next on the chicken run agenda is to create a box garden with wire cloth frame over it. I think we probably need to name our property. You know, like a real homestead. Since we are installing gardens and have chickens and all. I need a clever or witty name. We live on Horseshoe Dr so maybe the Hretz Horseshoe Homestead. Have and ideas?